Please click here to find out changes to our current programme. It is strongly adviseable to pre book your tickets for peak sessions. Click here to book. Spectrum Ice - The Coolest Place to have Fun! Guildford Spectrum houses an Olympic sized ice rink which is used by thousands of people each week. Whether you are an experienced ice dancer or a wannabe Flames player, Spectrum Ice is available all year round for you! The ultimate disco experience, Friday, Saturday and Sunday nights. Click here for more information. 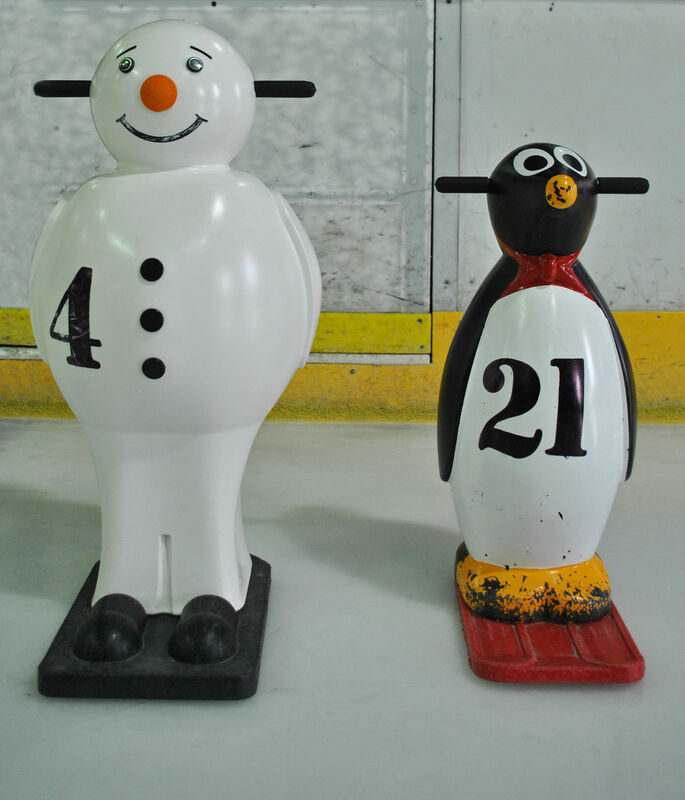 "Penguins and Snowmen"" are available to hire during daytime only Skate for All sessions on a first-come, first-served basis. Please be advised we have a limited number available and they are hired in 30 minute sessions @ £3.50 (subject to availability). At peak times the penguins/snowmen are very popular with our younger visitors. Please click here for further details. We recommend that children wear a helmet whilst on the ice. Adults can also wear helmets but they are available on a first come, first served basis. We don't have enough for every skater. Therefore if you have a cycle helmet with a chin strap bring that with you. Please note that our ice skates available from Skate Hire range from a child size 5 to an adult size 14. Spectrum Ice offers the opportunity for people with special needs and/or disabilities to access the ice rink via their wheelchairs. On the public skating sessions, accompanying carers skate for free and an adult entry ticket is charged, for those of concessionary status a reduced rate is available during off peak times. Sessions are on Tuesday (figure & rental skates only) and Wednesday evenings and are a relaxing skate with music. Also on Tuesday evenings there is a 15 minute dance interval at 9.15pm. Click here for information on Ice Skating Safety. Hockey Skates can be sharpened at anytime, subject to staff availability. Figure Skates can be left at any time and they will be sharpened within 48 hours. For more information about skate grinding please speak to a member of the Ice Team at Skate Hire. Please pay for skate grinding at Main Reception, £7.80 per pair.